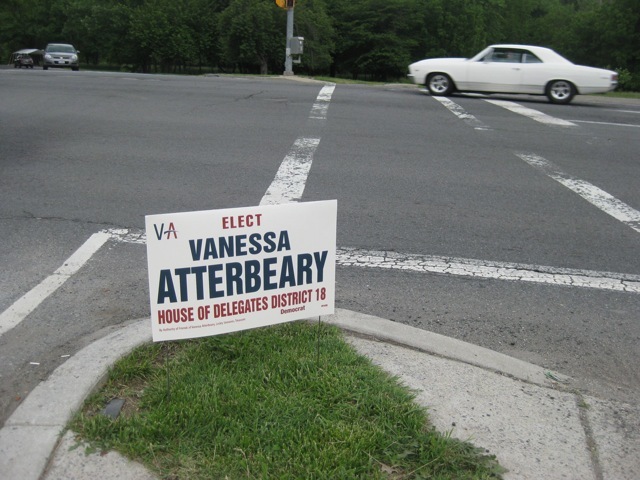 District 18 Delegate candidate Vanessa Atterbeary has broken two campaign rules in less than a month. She is off to a fast start – at least when it comes to illegal campaigning! Vanessa Atterbeary, candidate for Maryland House of Delegates, District 18. This week, I announced my candidacy because District 18 needs a strong advocate for women, children and family priorities. For a real voice, vote for me, Vanessa Atterbeary. Now is the time. 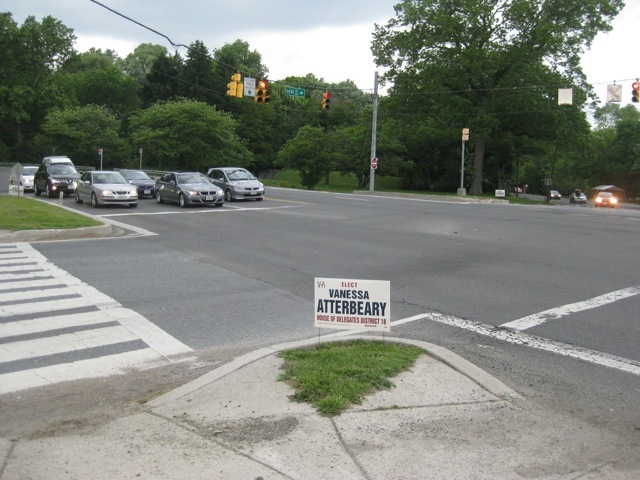 Thank you, and remember to vote for Vanessa Atterbeary for District 18 and for Montgomery County. Section 1-101 of Maryland’s election code defines campaign materials as “any material that… relates to a candidate” and includes “an oral commercial campaign advertisement,” in other words, robocalls. Section 13-401 requires all campaign materials to include authority lines listing the name of the campaign finance entity and the name and address of the campaign treasurer. The address may be omitted if it is on file with the State Board of Elections or if the material is too small to include it, but the name of the treasurer must always be stated. But that is not all. 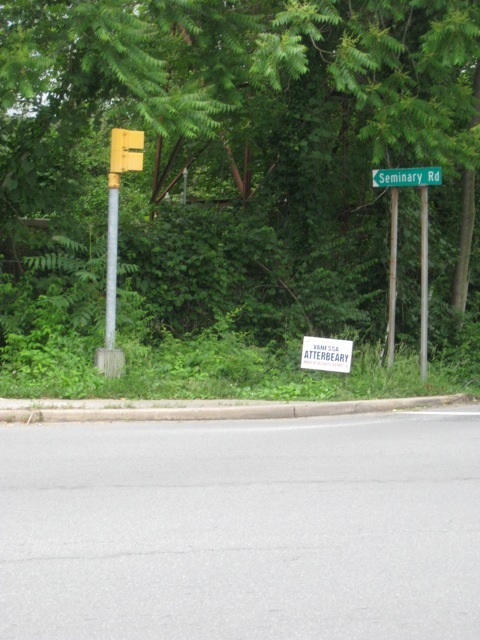 Atterbeary’s campaign has also placed countless illegal campaign signs around the district. State Highway Administration regulations state that political signs “may not be placed in the median or within SHA right-of-way, just as other signs are prohibited.” County regulations also prohibit signs in medians on county roads and mandate their placement at least 100 feet from intersections if they are in the public right-of-way. 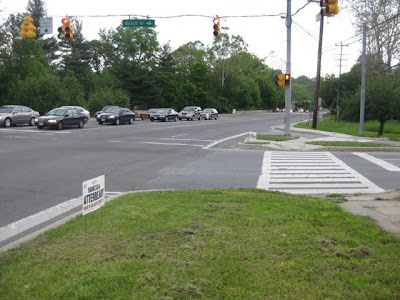 Here are a few examples of these illegal signs. 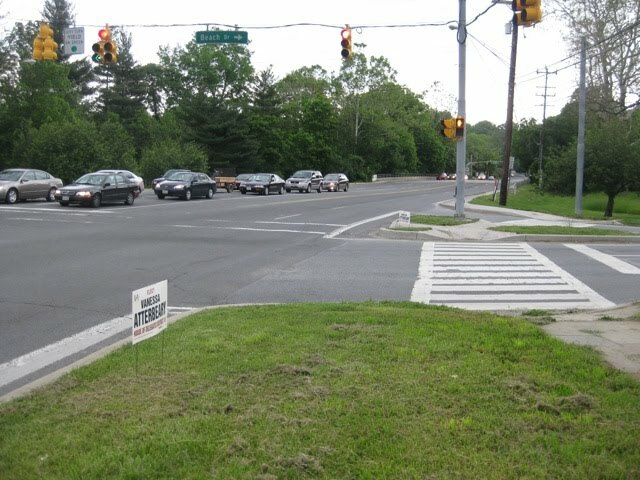 There have been many others placed on the Connecticut Avenue median, at bus stops, at the Connecticut-University intersection and even at the Connecticut-Beltway interchange. At one point, Atterbeary’s illegal signs outnumbered all the legal campaign signs in the district! Everyone is entitled to run for office, but no one is entitled to break the law. The Atterbeary campaign should apologize to the citizens of District 18 and run a legally compliant race from this moment forward. Where is Herman Taylor's Campaign Finance Report? Senator Nancy King: The Race is On! Is Pete Fosselman Running Against Valerie Ervin?